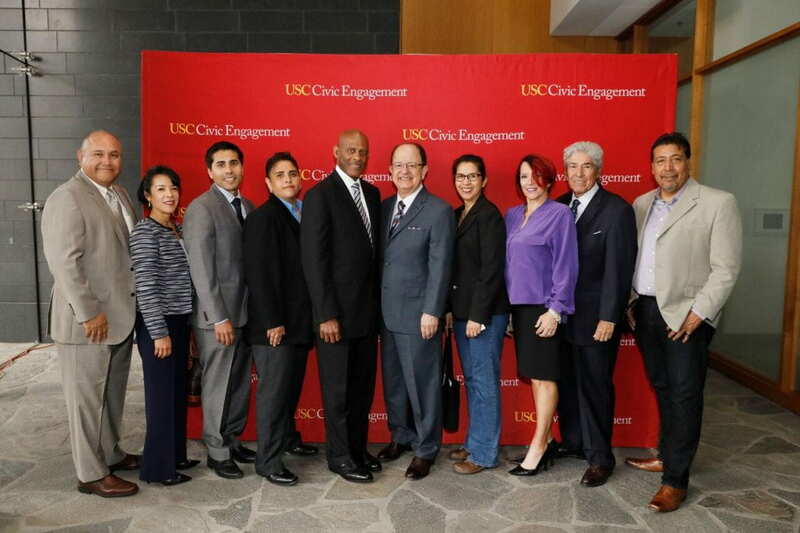 The “Business of Biotech” was held with community leaders and presented by USC Civic Engagement (VP Earl Paysinger, center left), featuring a keynote from USC President C. L. Max Nikias (center right). Did you know for every one biotech research job, four more jobs in support roles are created? According to a recent report, LA County gets just 13% of California’s $347 billion biotech business. Leaders from USC and the L.A. community joined to discuss how to support the growth of biotech and the economic benefits that come with it. Watch the archived Facebook Live videostream from “The Business of Biotech” event, held on June 8, 2017, featuring remarks from the following speakers: USC President C. L. Max Nikias; Thomas S. Sayles, Sr VP of University Relations; Earl Paysinger, VP of USC Civic Engagement; Willie Zuniga, President of Grifols Biologicals (El Sereno); and Rohit Varma, Dean of Keck School of Medicine of USC.